Why is black smoke coming out of my exhaust pipe? This short blog series is going to be about the causes and remedies of white, blue, and black smoke from your engine exhaust. Today we take a look at black smoke, what it means, and how to fix it. Black exhaust smoke means the engine is burning too much fuel. The first think you should check is your air-filter and other intake components like sensors, fuel injectors and the fuel-pressure regulator. Other reasons could be a clogged fuel return line. Black smoke is usually the easiest issue to diagnose and fix, but burning unnecessary fuel will definitely affect your fuel economy, so don’t think of avoiding this one to save money, any delay will be very costly. What is the smoke is Greyish? Grey smoke is hard to diagnose directly. Like blue smoke, it can mean that the car is burning oil or if your vehicle is so equipped it could be suffering from a bad turbocharger. Take the same precautions as with blue smoke, and check for excessive oil consumption. You can read all about why this happens and how to fix it right here. If you have a pre 2000 year vehicle then grey smoke could possibly be an issue with your automatic transmission fluid getting burned up in the engine. A faulty transmission vacuum modulator would be the culprit in this situation, leading to transmission fluid getting sucked into the engine and getting burned up. There are a few other potential culprits, so if you are not mechanically inclined and you see plumes of grey or black smoke, it is best to bring it in for a service. 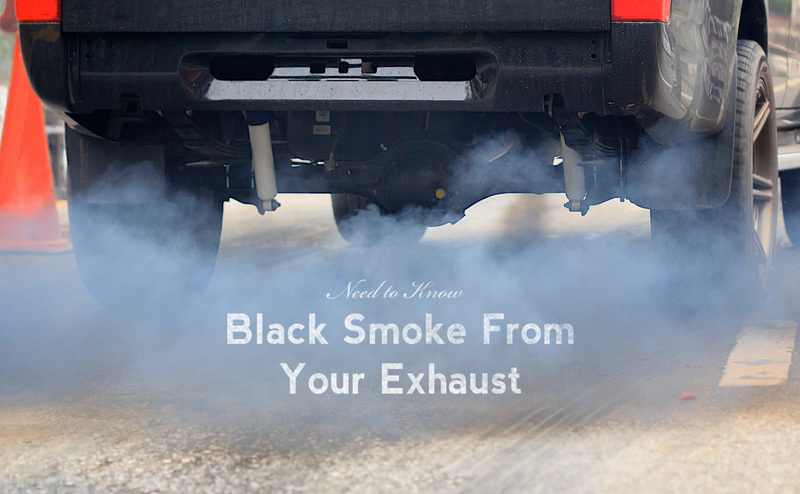 Are you having excessive black or grey smoke from your vehicle? Maybe a rough idle and misfiring engine? Be in touch anytime, we are happy to help you diagnose it. Please how should I correct excessive fuel consumption of fuel in my car? Give us a call with some details and we can help you out Isaac! Hi. I have a 2003 hyandi santa fe 4×4. There’s a few issues, slipping clutch, bouncy suspension and now black smoke. When accelerating there is a loss of power. Just send us a message through our contact form to get a service tech. Thanks Anthony!